Like some bird species are want to do, Zone-tailed Hawks occasionally wander out of their "expected" range and end up in some unlikely places. One traveled so far out of its range, it ended up in Novia Scotia, Canada! The Zone-tailed Hawk copies the dihedral "wobbly" flight of the Turkey Vulture - a bird that scavenges rather than hunts its food. Scientists believe the hawks mimic the vulture's flight pattern in order to fool their prey, to be able to get closer to it before attacking. The Zone-tailed Hawk is also known as the Zone-tailed Buzzard. 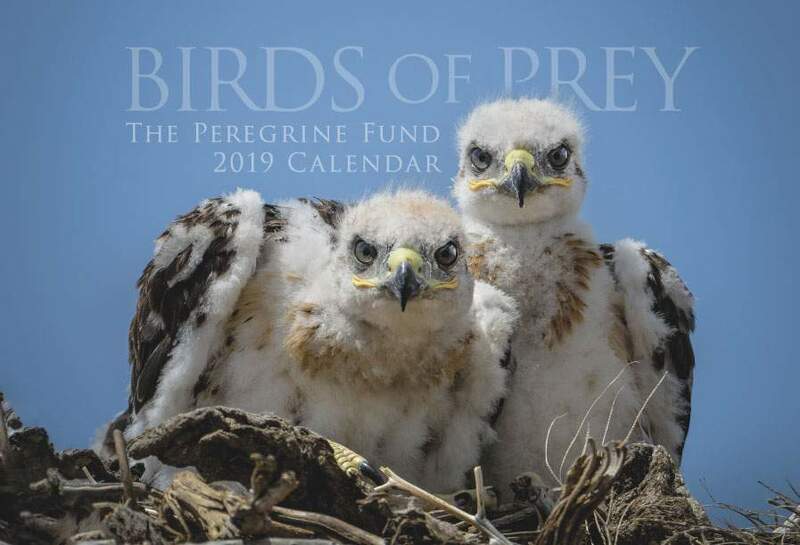 Though The Peregrine Fund doesn't work directly with Zone-tailed Hawks, our efforts in scientific research, habitat conservation, education, and community development help conserve raptors on a global scale. We also supply literature to researchers from our avian research library, which helps scientists around the world gather and share important information on raptor conservation. The Zone-tailed Hawk makes it home throughout the Americas, south of Canada. In the United States, it inhabits parts of southern Arizona, New Mexico, and west Texas. Its range then continues southward into most of Mexico. It is found in every country in Central America, and throughout much of South America. It is also found on Trinidad and Tobago. 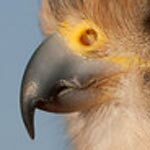 As with many bird species, some Zone-tailed Hawks need to move to warmer climates when the weather starts to grow cold. This often has to do with lack of sufficient food sources during the winter. Though not all Zone-tailed Hawk populations are migratory, individuals living in the southern United States and northern Mexico often are. When days get shorter and a chill is in the air, these hawks will get ready to travel further south. Unlike some birds that travel great distances, these Zone-tailed Hawks usually don't have to go too far to find an inviting climate and enough food. Many end up going no farther south than southern Mexico! This medium-sized hawk isn't a high-altitude bird and is most often found in lowlands and foothills throughout its range. It prefers wide, open country with scattered trees, or riparian areas. An adult Zone-tailed Hawk is mostly black all over, with the exception of the white bands on its tail and the whitish-gray flight feathers. It has yellow legs, a yellow cere and dark eyes. When not soaring high in the sky, this raptor can sometimes be seen perching in trees at forest edges, often in shady areas. Outside of breeding season, the Zone-tailed Hawk is a solitary species - meaning it rarely spends time in the company of other Zone-tailed Hawks. However, it can sometimes be seen flying with Turkey Vultures - mimicking their wobbly flight and the way they hold their wings in a "V" shape. But they don't just copy Turkey Vultures for the fun of it! They do it to fool their prey into thinking they are a harmless scavenger - which allows them to better sneak up on their quarry. If you are in Zone-tailed Hawk territory and you see several Turkey Vultures soaring across the sky - take a closer look - especially a their tails. If you see one with white bands, you are actually not seeing a Turkey Vulture - but very likely, a Zone-tailed Hawk. The Zone-tailed Hawk is one of North America's least known raptors. However, the species is considered to be of Least Concern, meaning scientists aren't worried that this lovely raptor is going to have massive declines in its population any time soon. Because of its wide range and the fact that its population appears to be expanding, this species seems to be doing quite well for itself, at least for now. And that's good news! The Zone-tailed Hawk, like most predators, is an opportunistic feeder. This means if it sees an opportunity to catch something, it will take it! It has a varied diet which includes a number of different birds, including California Quail, Red-shafted Flicker, Acorn Woodpecker, Eared Quetzal, Stellar's Jay, Yellow-rumped Caciques, Tropical Kingbird and even a fellow raptor species - the Eastern Screech Owl. It also feeds on reptiles, and appears to be a fan of just about any type of lizard it can catch, such as Yarrow's Spiny Lizard, Crevice Spiny Lizard, and Mesquite Lizard. The Zone-taild Hawk also feeds on a number of mammals including chipmunks, bats, Tawny-bellied Cotton Rat, and White-eared Cotton Rat. It has also been documenting feeding on insects including locusts and beetles. The Zone-tailed Hawk uses a few different hunting techniques to capture its prey. Typically, it spends a lot of time soaring above the canopy searching for its next meal. When it does, it quickly dives onto its prey. Just like many species of raptors, including Swainson's Hawk, the medium-sized Zone-tailed Hawk is known to hang around grass fires to capture small animals fleeing from the flames. The Zone-tailed Hawk builds a good-sized stick nest in the shape of a platform, usually about 10-15 meters high in a strong tree. It often lines the nest leafy twigs and other greenery. Though some of the nest lining might just be to make the substrate softer and more comfortable for the nestlings and the incubating adults, but scientists believe that some of the green material the adults bring to the nest acts as a natural repellent against ectoparasites (parasites that live on the outside) that might infest the nest, the nestlings or even the adults. Once the time is right, the female will lay between 1 and 2 white or whitish-blue eggs. After fledging, the young hawks still need time to practice their flying skills and to hone their hunting abilities through hard work and practice in what appears to us like playing. 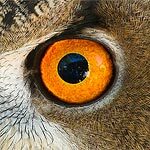 Scientists studying a nest in Mexico observed several types of interesting behaviors - young Zone-tailed Hawks flew at the tops of trees, grabbing pine cones or sticks and footing them or biting at them while in flight. They also observed young hawks diving off a perch onto the ground, "attacking" sticks or other inanimate objects. As the juveniles get older, they will start to spend more and more time away from the nest site. Similarly, the adults also spend less time near their young. Scientists have observed some aggressive behavior between the adults and the juveniles, and between the juveniles. This behavior could signal to the young that it is time for them to disperse from their parents' territory. The World Center for Birds of Prey offers fun ways to learn about birds of prey. Interactive activities, tours, interesting videos and a children's room with activities from coloring sheets to quizzes to costumes and a touch table are available for the curious mind. We also have several birds of prey on display year-around, including a Red-tailed Hawk and a Swainson's Hawk. Knowledgeable staff and volunteers are on hand to answer any questions you may have about Zone-tailed Hawks or any other birds of prey.